Las Vegas, January 10th, 2018: CES, which takes place at the Las Vegas Convention Center annually, is the world's gathering place for all those who thrive on the business of consumer technologies. It has served as the proving ground for breakthrough technologies for over 50 years and with the current commencement of 2018 CES, THINKWARE has marked the successive participation of 7 years. THINKWARE has introduced an extensive line-up, starting with novel upcoming products that are based on THINKWARE’s technological advances. Along with the new products, THINKWARE will also exhibit 2017 CES Innovation Award-Winning F800 PRO, as well as a variety of popular, steady sellers like F800, F770, X550, X350, X330 and F50. One of THINKWARE’s pioneering new products was the new ADAS (Advanced Driver Assistance System) device. The ADAS device’s progressive capabilities include but are not limited to a variety of collision and departure warnings such as Lane Departure Warning System, Front Collision Warning System, Urban Front Collision Warning System, Front Vehicle Departure Alert, Headway Monitoring Warning, Pedestrian Collision Warning, Wrong Way Alert, Driver Attention Alert and Haptic Warning, all of which offer the driver a safer driving experience. Another major breakthrough was THINKWARE’s M1 (Motorcycle Cam) and Planar (Sports Cam). These products marked an expansion and growth into new product categories. THINKWARE’s booth (#3134) prepared a variety of zones in which patrons can directly experience these new innovative features of THINKWARE’s product line. The booth has been divided into 5 separate zones in order to fully demonstrate each of these varied capabilities. Of these zones, patrons were surprised by the degree of experiential immersion that the set-up offered. Of them the THINKWARE ADAS Zone and SNV Zone truly gave consumers a clear perception of THINKWARE’s product capabilities. The THINKWARE ADAS Zone gave attendees a chance to perceive how the ADAS device worked through virtual reality and how it enhanced the safety when driving. The SNV Zone allowed attendants to compare THINKWARE’s Super Night Vision 2.0 with competitor products through a dark room in order to compare capabilities. This immersive experience showed off the superiority of THINKWARE’s night vision as compared to competitor products. 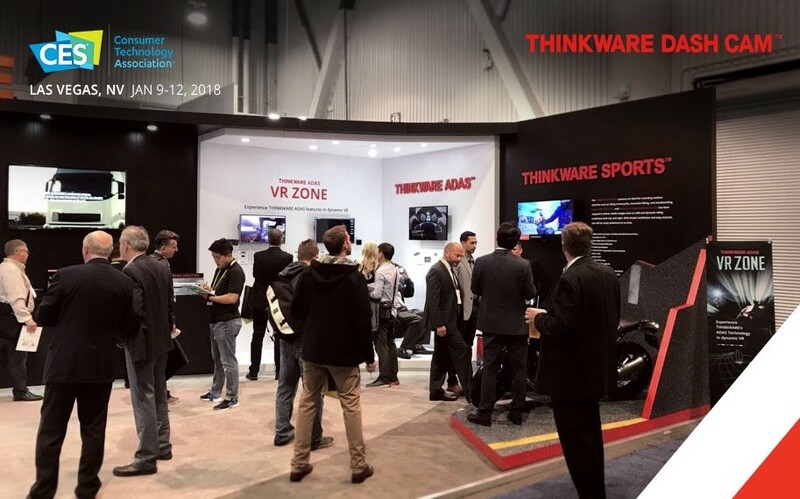 Attendees who visited THINKWARE’s booth #3134, located in the North Hall of the Las Vegas Convention Center, were offered an experiential way to encounter the automotive accessory category. The booth impressed numerous attendants through new product advances and unconventional hands-on experience. The booth also offered a variety of social media events in which consumers had the chance to receive THINKWARE Dash Cams. THINKWARE has proved itself, to many consumers, to be a forefront leader within the automotive accessory industry through its innovative products and advanced technology.